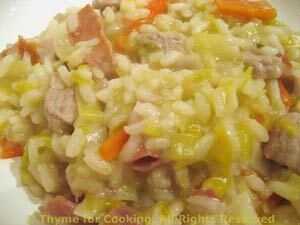 Veal and Leek Risotto, Thyme for Cooking easy one dish dinner. Risotto at it's most Italian: with veal and Prosciutto as well as the Parmesan. Use true Parmigiano Reggiano if you can find it. Use the white and pale green part of the leeks. Clean leeks and roughly chop amount for rice, reserving remainder for Condimenti. Add leek and sauté until tender. Peel carrot; cut in quarters the long way, then in slices. Add carrots, leeks and sauté until tender, 7 - 10 minutes. Add Prosciutto and sauté 5 minutes longer. Add cream or yogurt, cover and keep warm until needed for risotto.